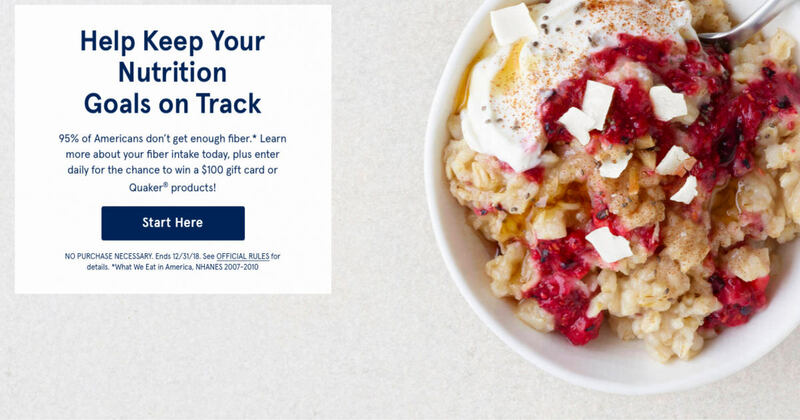 Enter the Quaker Fiber Check instant win game for a chance to win $100! There will be 65 first prize instant winners, winning a $100.00 pre-paid debit card. There will also be 1000 second prize instant winners, winning a digital coupon good for one free Quaker Oats product limited to Quaker Old Fashioned, Quick, or Instant Oats or Quaker Oatmeal Squares cereal, valued up to $5.99. Coupon awarded via email. This game is open only to legal residents of the 50 United States and the District of Columbia who are 18 years of age or older as of October 1, 2018. Void where prohibited by law.